The Grow Advisors figures for the first quarter of the 2018/19 financial year have landed on INO’s desk and what’s most obvious is the grip that Worrells has on the market for creditors voluntary liquidations specifically and the formal appointment market in general. 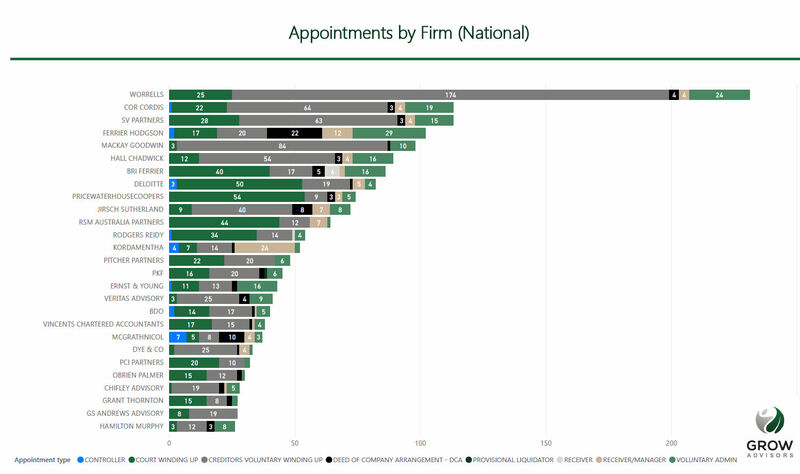 The national mid-tier smashed its rivals for the period from July 1 to September 30, raking in 174 CVLs out of a total 231 appointments, which also included 25 court-appointed liquidations (CLs), and 24 voluntary administrations (VAs). To get a sense of how far in front Worrells is, its 174 CVLs represented more than 12 per cent of the national total of 1404. Second place getter Cor Cordis managed 64 CVLs, not much more than a third of Worrells’ tally. On the CL front, things were much closer, with Cor Cordis locking in 22. Similarly Cor Cordis was also much more competitive when it came to VAs, locking in 19 for the quarter and notching up a total of 123 appointments. Third place getter SV Partners surpassed Worrells and Cor Cordis in terms of CLs with 28 and racked up 117 appointments in total. Ferrier Hodgson managed fourth, due in part to it securing 12 receiverships and 22 deeds of company arrangement (DoCAs) during the period. If industry rumours that KPMG has been sniffing around Ferrier Hodgson have any truth in them then its impressive first quarter figures could explain the interest, particularly when considered in the light of the Grow Advisors’ tables indicating that KPMG did not win a single insolvency appointment of any kind during the period. If KPMG is to remain competitive with PwC now that the latter has acquired PPB Advisory’s insolvency and restructuring expertise, then buying Ferriers might be an option and if recent reports that KPMG approached Grant Thornton are correct then it sounds like the big four firm is in the market. Rounding out the top five figures nationally was Domenic Calabretta’s Mackay Goodwin, which actually placed second to Worrells in terms of CVLs with 84, but trailed well behind the other four in respect of CLs and VAs. 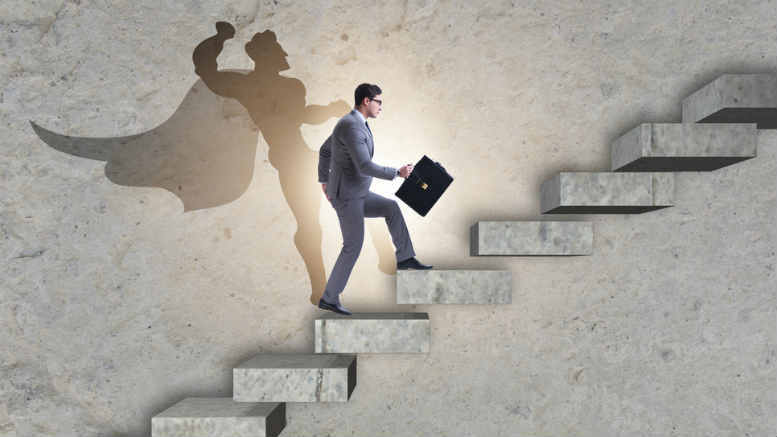 The Grow Advisors’ data also provided insights into individual performance, with state by state breakdowns of the most prolific practitioners – in NSW Jones Partners’ Michael Jones, Ferrier Hodgson’s Morgan Kelly and BPS Recovery’s Daniel Frisken were on fire. In Victoria, GS Andrews Advisory’s Greg Andrews beat all comers, followed closely by Worrells’ Con Kokkinos and PCI Partners’ Philip Newman. Up in the north, Glenn O’Kearney of GT Advisory & Consulting took out top honours, followed by KordaMentha’s man in Townsville Anthony Miskiewicz and Artemis Advisory’s Peter Dinoris. Other standout performers included Ferrier Hodgson’s Martin Jones in West Australia and Simon Coad of Ticcidew. 2 Comments on "First quarter insolvency figures reveal one big winner"
How much in fees were generated by those CVLs? No point in winning that many unless you get your margins right. I suspect the list would look significantly different if you were looking at revenue/profit. @Scrooge McDuck, I am pretty sure that the Worrells’ sausage factory has the profitability issue covered. The actual question is, with that many appointments, and a what is suspected, a lowish rate, what level of scrutiny is being given to the files? In what could only be seen as a race to the bottom, quality is going to suffer.